ICDT 2017 was held in Fuzhou on Feb.18-20, 2017. It attracted nearly 1000 attendees, of which more than 100 overseas attendees. v Nearly 30 distinguished experts of display industry from China and oversea, of which are 2 CAS members, 1 US NAE member and 11 SID Fellows. v11 Keynote Addresses in Plenary Session. v2-days oral presentation: 17 technical fields, 54sessions, 256 invited talks. v4 Seminars : Advanced TFT、Quantum Dots & Related Displays、Printing Displays、AR&VR&MR. 针对工程师、研究人员等的4个专题技术讲座：Advanced TFT、Quantum Dots & Related Displays 、Printing Displays、AR&VR&MR. v10 presentations in business conference. ICDT 2017 attracted about 30 prominent scientists, academia and enterprise elites in the field of display technology from China, United States, Europe, Japan and Korea to make keynote speeches and invited talks. Samsung, LG, JOLED, Dow Chemical, Sumitomo, Honeywell, Kyulux, UDC, Nanosys, DuPont, eMagin and other well-known overseas enterprises also sent their research and development leaders to give speeches. Many well-known professors in the field of display from MIT, UC Berkeley, Columbia, Cambridge, University of Rochester, University of Central Florida, Seoul National University and other overseas universities gave presentations. A large number of famous experts gathered together in the ICDT 2017 opening ceremony and the plenary session. They were Ching W.Tang, ZhongcanOuyang, Vivian Wing-Wah Yam, Shin-Tson Wu, Hoi S. Kwok, Amal Ghosh, Yong-Seog Kim, John Chen, Jin Jang, Changhee Lee, Baoping Wang , Xiaolin Yan, Qun Yan, Arokia Nathan, Toshiaki Arai, Soo young Yoon, Kathleen O'Connell, Takeshi Yamada, Yi-Pai Huang, etc. They gave keynotes focusing on OLED display, Flat Panel Display, Flexible Display, TFT, LCDs and other hot topics. 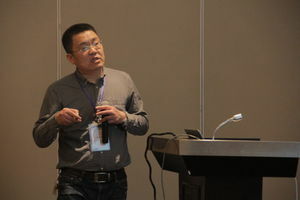 In the 2-days ICDT oral presentation, speakers were from well-known universities from home and abroad, such as Tsinghua University, Peking University, Fudan University, Shanghai Jiaotong University, Southeast University, Sun yat-sen University, North Polytechnic, Zhejiang University, Shanghai University, Huazhong University, Hong Kong Polytechnic University, National Taiwan University, University of Florida, Korea Kyung Hee University, etc. and from famous enterprises, such as BOE, TCL, CEC-Panda, Tianma, Huaxing Optoelectronics, Visionox, New Vision, etc. as well as major scientific research institutions, such as Institute of Semiconductors, Chinese Academy of Sciences, Suzhou Institute of Nano-Tech and Nano-Bionics(SINANO), Chinese Academy of Sciences, National Institute of Metrology, China, etc. More than 250 speakers in total at home and abroad launched technical exchanges around AMD, OLED, Display Manufacturing, Display Measurement, E-paper & Flexible Displays, Printed Display, AR & VR and other 17 technical fields, 54 sessions. Above is only a glimpse of ICDT 2017 and it was merely the first International Conference on Display Technology!